Inspired by the wisdom of Ayurveda, we have created a line of foods that will give you healthy choices that nourish, rejuvenate and soothe your mind, body, and spirit. Ayurveda, “the science of life”, is the ancient healing system of India that dates back over 5000 years. 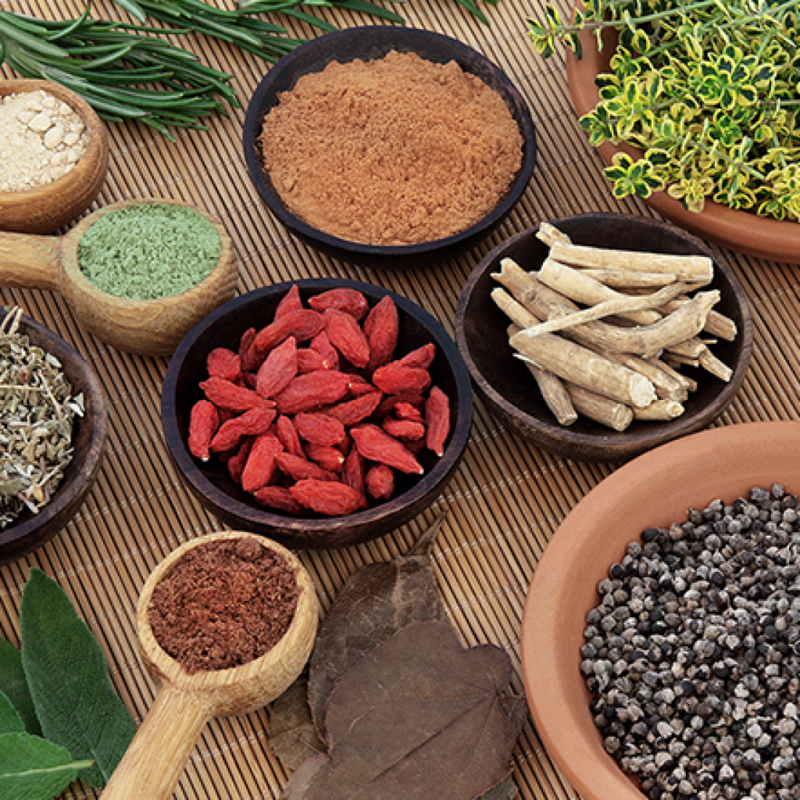 Ayurveda originates from the Vedas and reflects healing wisdom passed down over thousands of years. Ayurveda has influenced many healing traditions and has made its way to the West where many people are experiencing its benefits during modern times. Due to its increasing popularity more and more studies are proving the many benefits of Ayurveda. As a highly integrated system; lifestyle, environment, daily routines, seasons, time and place all play a vital role in the health of a person. Each person has a unique physical, mental, and spiritual make up known as Prakruti (in Sanskrit) or Constitution or Mind/Body type. The focus is on maintaining health and harmony between one’s mind, body, and soul and the environment that surrounds us. Our ego or self identity is expressed through 3 energetic and subtle qualities known as Sattva (goodness, purity, light), Rajas (passion, action, emotions), and Tamas (inactivity, darkness, and ignorance). From these energies come the five elements: Ether/Space, Air, Fire, Water, and Earth. These five elements are present in all matter, in each individual, and in a single cell. Finally, these five elements manifest in the body as a combination of three bio-energies or doshas; Vata, Pitta, and Kapha. A combination of these three doshas are present in every person and are responsible for our unique qualities and individual differences. Every person has qualities of all three, but most people are predominantly one or a combination of two doshas. Health is defined as a balance of these doshas, as they were upon conception, prior to when our environment, experiences and choices were able to alter this delicate balance and create changes. Poor health and disease manifest as a result of an imbalance in the doshas. If we eat a diet and maintain a lifestyle that is appropriate for our mind/body type, according to the season, time, place and circumstances, we can reach and maintain optimal health and emotional balance. Unfortunately, our lifestyles, emotions, eating habits, and our environment often do not allow us to stay in harmony with our true nature. In Ayurveda, the choices we make on how we nourish our body, mind, and souls are essential to achieving good health and vitality. While only a qualified Ayurvedic practitioner can give an accurate reading of your dosha, the following brief outlines can be a starting point to discovering your predominant doshas. Smaller active eyes and thinner lips. Tendency towards dry rough skin, cold extremities and constipation. Creative, lively, social, adaptable and enthusiastic. Tendency towards anxiety, fear, worry, and restlessness. BENEFITS from: warmth, moisture, routine, relaxation and rest. Medium intense eyes and medium lips. Craves cool weather & fresh air. Determined, passionate, organized, competitive and intelligent. Tendency towards anger, irritability and criticism (of self or others). BENEFITS from: cooling foods, nature, fresh air, gentle meditation, peace and calm. Large soft eyes and full lips. Soft oily pale skin with a tendency towards congestion and mucous. Loves relaxing and being at home. Calm, kind, compassionate, loving, and affectionate. Tendency towards feeling down, lethargic and withdrawing inwards. BENEFITS from: warmth, exercise, adventure, sunshine and action.